Generations of quality education supported by evangelical values. Ontario’s highest graduation rate coupled with high level bilingualism. 21st century skills in a modern and inclusive environment. This modern version of l’école catholique’s mandate provides a framework for school boards and their schools, supporting each student’s development. From October 2 to the 27, in honour of their 20th anniversary, Ontario's eight French-language catholic school boards, in collaboration with l'Association franco-ontarienne des conseils scolaires catholiques, organized a province-wide appreciation tour throughout October. From Red Lake to Ottawa, from Pain Court to Nakina; the Tour allowed Ontario's eight French-language catholic school boards to thank and congratulate 18 individuals that truly make a difference within their school community. 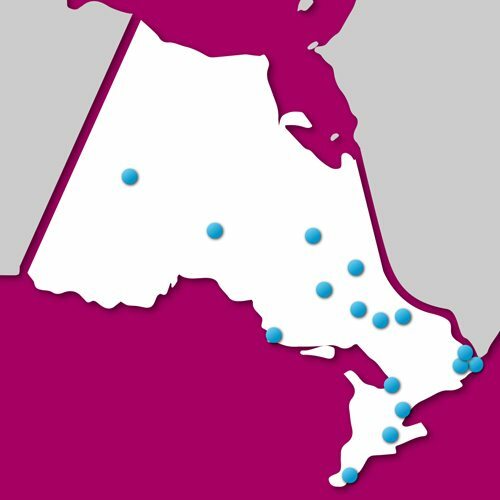 Throughout October, Ontario’s eight French-language catholic school boards shared photos and videos of their province-wide Appreciation Tour through social media. Worried that you missed out? Here's a recap showcasing all of the Tour's highlights! All students and staff members benefit greatly from the relationship between l’École élémentaire catholique Sainte-Croix and the Rendezvous Lafontaine, a bilingual residence for senior citizens. Rosita Desroches, its director, has over the years crafted many intergenerational projects to help students learn and develop useful skills. Rosita Desroches, ever devoted to everyone’s well being, and the Rendezvous Lafontaine are both very important to this rural community. After graduating from Sudbury’s Sacré-Cœur school, this young woman became devoted to her community and constantly manages to enrich the lives of everyone around her. Proud of her francophone, catholic and Métis heritage, Mélanie-Rose is a young leader worthy of recognition. For more than 20 years, Serge has been cultural and pastoral ambassador for l’école secondaire catholique Cité des jeunes. He contributes daily to the school’s climate by organizing activities throughout his community and abroad, having accomplished missionary work in the Dominican Republic alongside his students. Serge is a true role model for us all through his acts of kindness. Paul Gélinas is not only a veteran; he is also a bus driver and has been insuring his young passengers’ safety for many years! Punctual, kind-hearted and respectful, he is deeply appreciated by his community and all the children. He is a true ambassador for our values. Mélanie has created quite the connection with her students with her sense of humour, her smile, creativity and good will. It’s because of this great connection that her students came up with an idea to help their community’s homeless population. Mélanie encouraged them to go through with the project and they proceeded with gathering winter clothing. The clothes were then distributed throughout the community and the project was so successful that it inspired others to continue the work started by Mélanie’s students. This magnificent gesture allowed the students to not only learn a valuable lesson, but to follow through on their dreams while becoming model citizens. Patient, calm and devoted, Lucie Gunter is loyalty incarnate. She has been working alongside a special needs student ever since he started kindergarten over ten years ago. Lucie’s devotion has payed off, for this student is now in 10th grade! Denis is not only a seasoned hockey coach; he is also a passionate teacher. Involved in many extracurricular activities relating to academics, faith, language, culture and sports, his passion is relentless. Recently, he helped his physics students to participate in a contest organized by CERN, the European Organization for Nuclear Research... And they won first prize! Denis truly places his students above all else. Jean-Paul II catholic elementary school is blessed with a remarkable team. Their role is important, for this school offers very special services. You see, Jean-Paul II offers programs and services for students with special needs, including deafness, impaired hearing, blindness or both deafness and blind. Even though the school is equipped with state of the art facilities, both the staff and the students are the ones who make Jean-Paul II a place where everyone feels like home. Josée and Marc Lalonde have spent countless hours working on the Racecar 8 school project at l’École secondaire catholique de Plantagenet. This endeavour allows many students to experience the dynamics of Pro-Stock vehicle assembly, maintenance and support while being coached by the pilot, Marc Lalonde himself. This project started a decade ago and aims at teaching students about leadership, respect, teamwork and car mechanics. A true success story! Claude Maisonneuve has been a gym teacher for over 25 years. Not only does he have his students’ health and well being at heart, his devotion also extends to his community. Indeed, Claude’s devotion to others is enough to inspire Ontario whole! On the weekends, he busies himself helping people with no fixed residence by preparing home-cooked meals with his family. France McLeod, principal at Sault-Ste-Marie’s Notre-Dame-du-Sault school, is responsible for countless success stories, including North the dog and the elaboration of recruitment and retention plans. Thanks to her, the school shines as a prime example of French-catholic pride. Chantal Montenegrino is a teacher at l’École élémentaire catholique Bernard-Grandmaître, in Gloucester. Her specialty is ensuring her students’ success in both literacy and numeracy. In her spare time, she even trains fellow teachers for she is always on the cutting edge of academics. Loved and respected by parents, colleagues, community members and students, Chantal manages to deliver countless academic achievements every year! Hortense Mvuemba and Sulaiman Al Dhaim both work for the Conseil des écoles catholiques du Centre-Est as community involvement counsellors. Their task is to personally welcome newly arrived families and accompany them throughout the inscription process. However, for these two, it’s much more than a simple task: it is also a passion. Valued and respected by their colleagues, Hortense and Sulaiman are the very manifestation of goodwill and generosity. Many families are grateful to have met them after arriving in Canada! A teacher at l’École élémentaire catholique de la Découverte in Orleans, Geneviève’s specialty is teaching French to newly arrived students. Recently, the school welcomed an eight-year-old student from Lithuania that spoke neither French nor English. Not only has Geneviève helped introduce him to the classroom, she also stood by him at recess and even found another Lithuanian family in the area to help him feel more at home. Remarkable devotion! Roland Rochon has been a member of North Bay’s francophone community and a member of the St-Vincent-de-Paul parish for many years. Not only has he accomplished countless feats for the French-speaking community, he was also part of the Conseil scolaire catholique Franco-Nord staff for many years and today sits on the council as Vice-President. When Julie Simpson’s children started attending l’École catholique Sainte-Catherine, she decided to start helping out by volunteering. Since then, she’s supported the council as a community member, joined in fundraising activities and managed the Goûter santé program, an initiative aimed at providing healthy meals to the school’s students. Julie’s children have long graduated, but she helps out as much as ever! Liza Sutherland is the teacher responsible for everything pastoral at l’École secondaire catholique régionale de Hawkesbury. She takes her responsibilities to heart, for she manages to change lives for the better on a daily basis. Known to lead by example, her list of accomplishments is virtually endless and she never asks for anything in return. Teacher, library technician, administrative assistant... Dominique Vernier has done it all. She is known as the heart of Nakina’s Notre-Dame-des-Écoles. No challenge is too great for her when it comes to her student’s well being. Notre-Dame-des-Écoles is located in an isolated community and counts less than 10 students. However, that has never stopped Dominique from spreading joy through her wonderful personality. 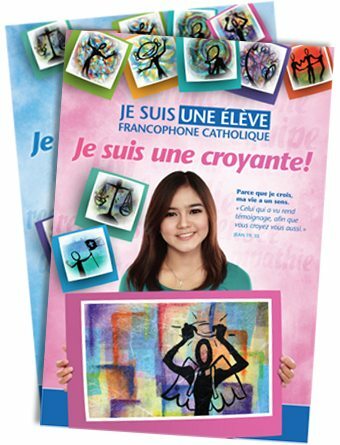 The francophone equivalent of the Catholic School Graduate Expectations, the Profil de l'élève catholique was officially launched on May 7, 2014 and guides French-language education in elementary and secondary catholic schools across Ontario. The Profil de l'élève catholique identifies our hopes and expectations and shares them as accessible models of language and faith to all students who pursue their learning path in one of our many French-language catholic schools. This tool was created to better guide Ontario's French-language catholic school boards and their schools in their mandate to contribute to the development of each entrusted student, providing a common framework encompassing our expectations for all graduates.